kapunda garden: Broccoli, new and old. Today is sunshiny and pleasant for working in the garden. I have been out weeding, harvesting and looking carefully at what is happening. 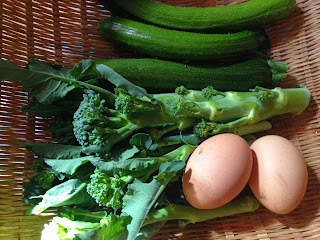 I have found five eggplant fruits that I hadn't expected, and I picked the broccoli and zucchinis, collected the eggs and began to think about what might be for dinner tonight… some variation on pasta primavera? 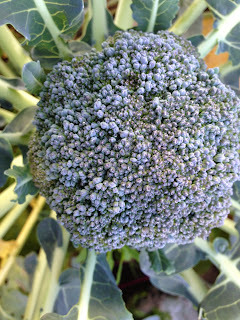 These are the last, surely of the brocoli to be collected from these plants. These plants are now about a year old and still producing enough broccoli for me to eat a couple of times each week. The plants do not look particularly elegant any more. I have picked, pruned and fed the excess leaves to the chickens and they are still producing enough for me to feast on every few days…. Actually, these plants look pretty ordinary, unlike the new ones that will soon take over their duties…. … this is the first of the 'new crop' which should be ready very soon. I'll cut the large top for a feast one of these days, but then leave the plant to continue production for another year or so. Broccoli has to be one of the most productive and valuable green vegetables. I don't use any pesticides on these. The few caterpillars that I don't find (they are easy to track down from the holes that they leave in the green leafy parts of the plant) are removed as I harvest the florets and are delivered, with the discarded leaves, to my chickens.